This loaf has become our favourite at home. Crusty, with a good crumb, and excellent sourdough flavour. The emmer and spelt make it rather nutty. Experiment with flours, or make it entirely white if you prefer. Once you become really good at it, on day 3 you can start adding grains like e.g. toasted buckwheat, which provide a really nice texture. The recipe is for Piers, by the way. 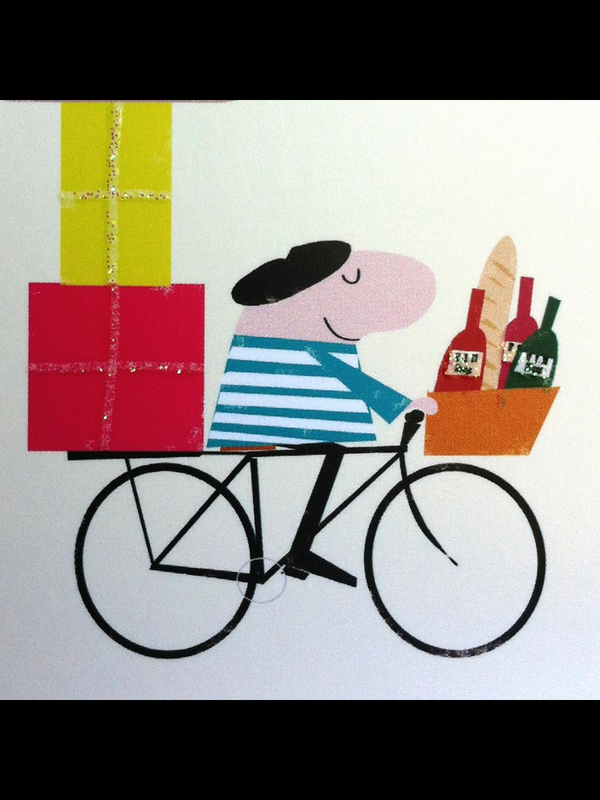 A good friend, who has sadly closed his lovely little wine shop, and therefore has a bit more time to cook and bake. Best of luck! Two days before you intend to bake, refresh your starter by discarding everything but a teaspoon, then adding water and flour until you have about 2dl. It should look like wallpaper paste or thick glue. Just before going to bed, mix the sourdough starter, cold water, emmer and spelt roughly in a very large bowl (i.e., the largest you have). Cover with a cloth. 8 a.m. Add the wheatgerm, flour and water to the starter mixture (if you are not using wheatgerm only add 525g water). Mix roughly with one hand, making sure everything is well blended. Leave to sit for 30 minutes, covered by a cloth. 8:30 a.m. Add the salt and water, and mix again with one hand. 9 a.m./9:30/10/10:30/11/11:30 Slide one hand down the side of the bowl and under the dough. Pull the dough up and over the top of itself (like folding a napkin). Rotate the bowl 90 degrees and repeat. Do four turns in total. Noon. Dust your proving basket with plenty of semolina (and some sesame seeds, if you like). Dust the dough with semolina, and form into a ball shape (still in the bowl). You do not want to work it too much, and it does not need to stay this shape – you just want to build up some tension and make sure the dough is not too sticky. Transfer quickly to the proving basket, and dust the bottom with semolina or polenta. Tricky bit done! Now, leave to rise for 2-3 hours in a warm place. 2:30 p.m. Turn on your oven to its absolute hottest setting (not grill, though). Place a large cast iron pot with lid in there. When the oven is hot, take out the pot, (pour in a little polenta if you want to make a nice crust), and carefully tip in the bread. Score quickly with a very sharp knife, put on the lid, and return to the oven. Bake for 40 minutes. After the 40 minutes have passed, open the oven door and bring the temperature down to 180 degrees (fan). Remove the lid and bake for a further 15 minutes. If you like your bread less dark, bake at 160 degrees instead, but for a couple of minutes longer. Leave to cool. * or white, or rye, or whatever you fancy, really. Mondays we often have pasta. Usually because we are all tired, and because pasta is popular. That said, pasta is not my favourite, and 2015 is the year of trying new things, so I did Meyer’s January vegetable curry instead. Well, sort of. I changed the veg and made some tweaks. Amélie loved it. Serves 3 with basmati rice and 6 small poppadoms plus chutneys. Geeta’s lime pickle and the chili one too are the preferred ones in our house, and the poppadoms you fry at home are the best. Cut the vegetables into pieces of about 2.5 x 2.5 cm. Heat a little oil in a pot and gentle sweat the onions with the curry powder until soft ans sweet. Add the vegetables and cook for 2 minutes, then pour in the water and simmer until the vegetables are tender – approximately 10 minutes. Stir in the cream and season with vinegar and freshly grated ginger (an inch or so). Serve with the herbs scattered over and a crushed poppadom on top. Steamed basmati rice on the side. A quick salad, served as a side dish or with a bunch of other salads. Serves 2. Chop the endive into pieces of about an inch. Cut a pear and a half into thin wedges, and roughly dice the remaining half. Mix the pears, endive and herbs, scatter over the nigella and season to taste. I have not baked rye bread in ages, mainly because I have not been able to get chopped rye. However, since discovering Shipton Mill there is chopped rye and flours aplenty. In line with my mission to seek inspiration from Claus Meyer this year, here is my version of his dark rye (mørkt kernerugbrød). Mix 2 dl water, yeast, starter and rye flour in a bowl, cover with a lid or damp cloth and set aside for 48 hours. Pour the remaining water over the chopped rye and seeds. Leave for 8 hours or until the water has been absorbed. 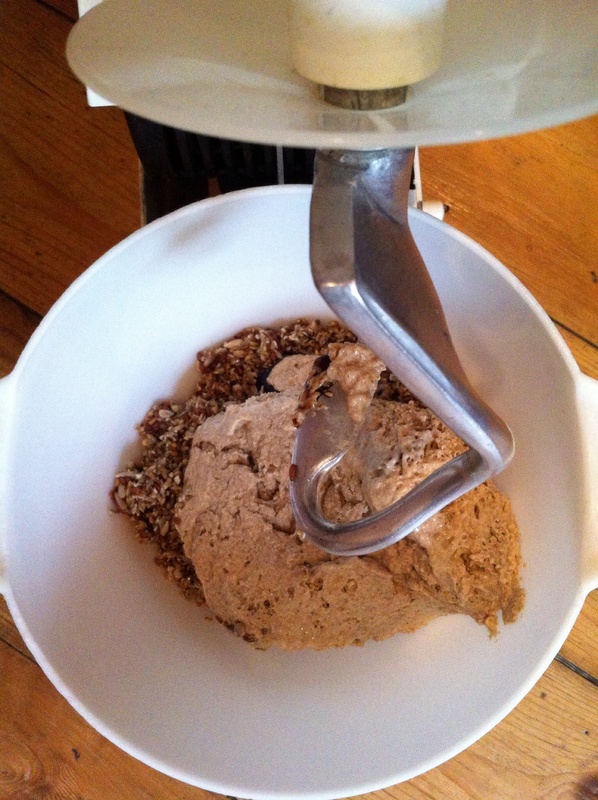 Combine the rye flour mixture with the seeds and add salt and molasses. Use a ‘robot’ to knead the dough for some 10 minutes, taking care to push the wet dough down if it clings to the side of the bowl. Grease the loaf tin well with sunflower oil. Pour in the dough and leave to proove somewhere warm for 3 hours (or longer, if the rise is slow). Bake the bread at 180C (fan) for 1 hour and 20 minutes approximately. Leave to cool for a few hours. 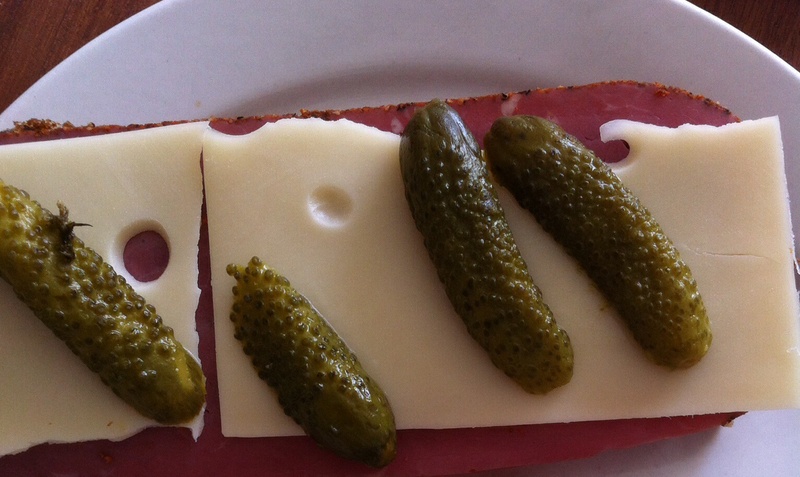 Enjoy with leek and potato soup or with pastrami, emmenthal and cornichons. Bread we eat a lot of in this house. Spelt, plain white wheat, dark rye. But almost always sourdough. Last week we took delivery of a load of flower from Shipton Mill. Some 15 kilos, in fact, as I got over-excited when browsing their stock. We now have chestnut flour, strong white flour, wholegrain spelt, white spelt, self-raising flour, dark rye, chopped rye, and emmer. Today I am putting the emmer to good use. It is a heritage type of flour that has witnessed quite a revival in Denmark over the past 10 years, but I have not seen it in the UK until now. 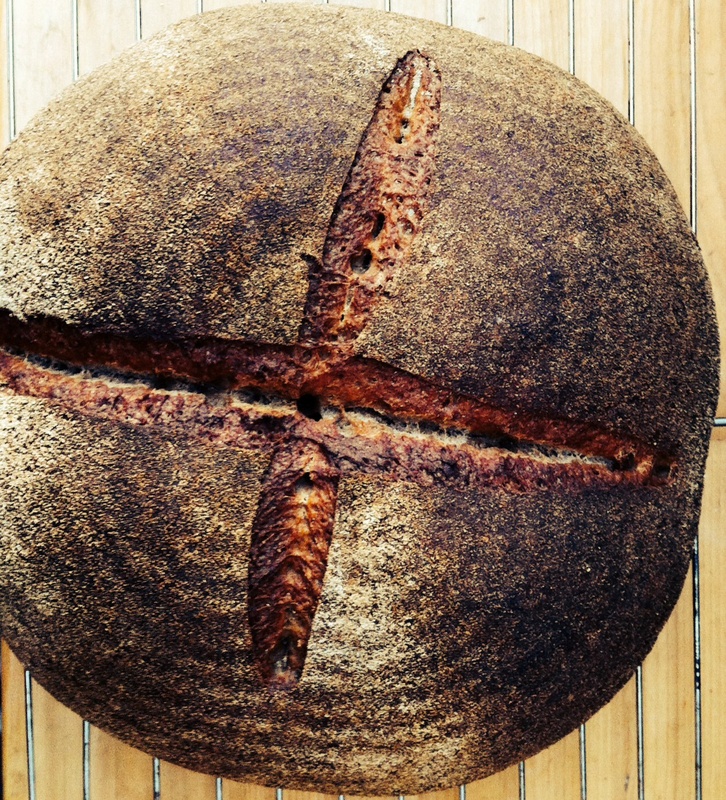 Emmer has quite a strong flavour – nutty and sweet, and more rounded than traditional wholewheat. You find emmer a lot in the Middle East (e.g. Turkey and Egypt), and the grain (farro) is frequently used in Italy too, particularly in the north. It is excellent served alongside savoury dishes, but I like it with marmaladeas well. The structure is more dense than a standard white sourdough, but it is not at all cloying like a bad soda bread can be. Dissolve the yeast in the water, then add the starter, flours and salt. Knead for 5 minutes on a low setting, followed by 10 minutes at a high detting (or knead by hand for 20 minutes). Grease the dough with rapeseed oil and place in the fridge in a large bowl covered with cling-film. Leave for 24 hours, or over night if you are pressed for time (but the final result is inferior – much more dense). Take the bread out of the fridge and transfer to a basket (if you have one) dusted with semolina. Leave to rise again somewhere warm for 2-3 hours. Place a baking stone in the oven (or a baking tray, if you do not have a stone). On the shelf below, leave a shallow dish full of water. Now preheat the oven to 240C. Once the oven is hot, carefully take out the hot baking stone. Dust the bottom of your loaf with polenta, then gently tip it out onto the baking stone. Score the bread, transfer to the oven, and reduce the temperature to 220C. Bake for approximately 35 minutes. I cannot follow a recipe. It is simply impossible. So, here is my take on Meyer’s January noodle salad. Recipe serves 3. Put the noodles in a bowl and cover with cold water. Leave for approximately 30 minutes (or until soft). Meanwhile, poach the chicken, then slice or shred once cool enough to handle. Finely slice the brussel sprouts, peppers and spring onions. Dice the mango, and roughly chop the herbs and peanuts. Bring the soy sauce, vinegar and honey to a boil, and reduce by about half. Take off the heat and add lime and oil to taste. Mix the ingredients for the salad, minus herbs and nuts. Toss with the dressing and sprinkle over coriander, basil, mint and peanuts. Add fresh chilli if you like – I do. Over the past year, I have hardly posted anything. At first, I was just tired. Then, I was sick 24/7. After that I felt awesome for a little while, only for exhaustion to take over. There was a good reason for it all: meet Alice. Now that she is here, I shall endeavour to blog again. 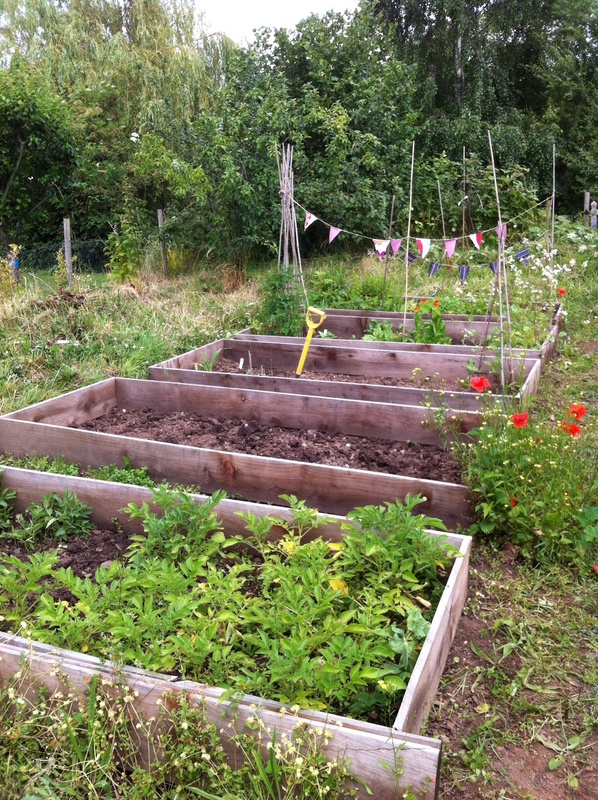 Get the over-grown allotment up and running again (weeds and grass loved my baby bump). A year in the kitchen inspired largely by Danish food entrepreneur and chef Claus Meyer. Principally from his book ‘Almanak’ and his baking bible. The lovely V was gigging, and there was no cake left in the house for his midnight supper. Pregnant and somewhat tired, I thought I would bake him something quick and easy to put a smile on his face. 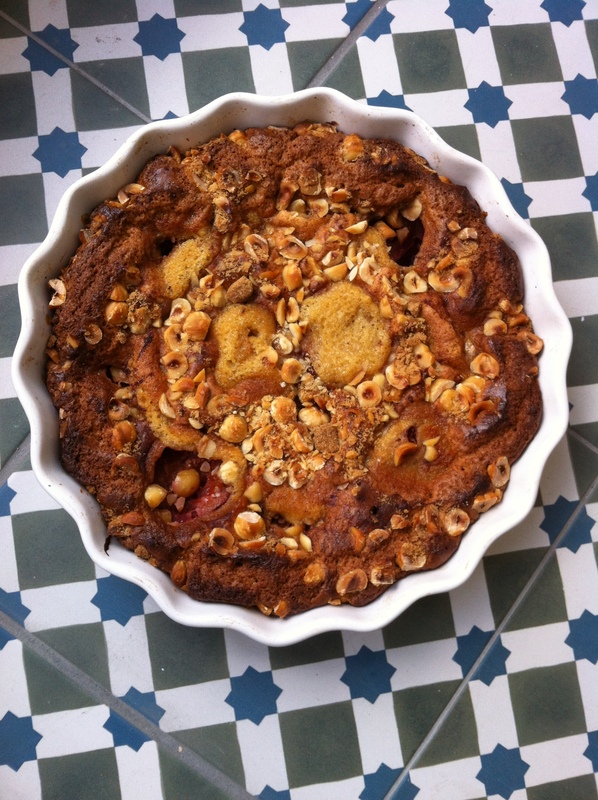 I came up with plum tart/cake as there were plenty of plums in the fruit bowl. We did not have a lot of butter, hence, the use of white chocolate. Half the plums and remove the stones. Melt the butter and chocolate and leave to cool slightly. Whisk eggs, sugar and vanilla until white and fluffy. Add flour, butter and melted chocolate (and cardamon if using). Grease a tart tin (if you use one with a loose bottom, you need to line it as the runny dough will otherwise escape). Pour the dough into the tin, then press in the plums, cut side up. Spread the chopped hazelnuts on top. Sprinkle w a tablespoon of sugar and the cinnamon. Dust with icing sugar if you must. Serve with crème fraîche or natural yogurt. 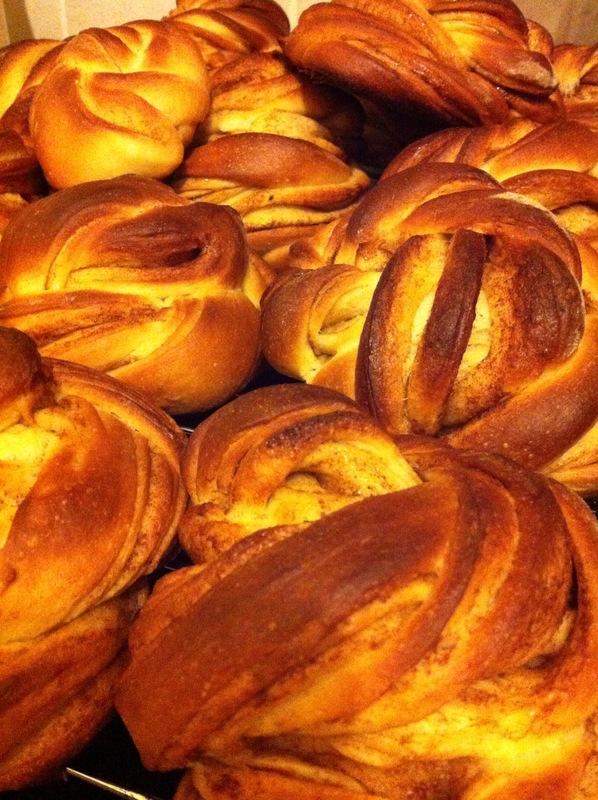 This week has been a baking bonanza: focaccia, fastelavnsboller (buns filled with creme patissiere) and kanelsnurrer. All three were a hit, so I shall post recipes for all. However, there is no question that the most popular were the kanelsnurrer. By a mile. 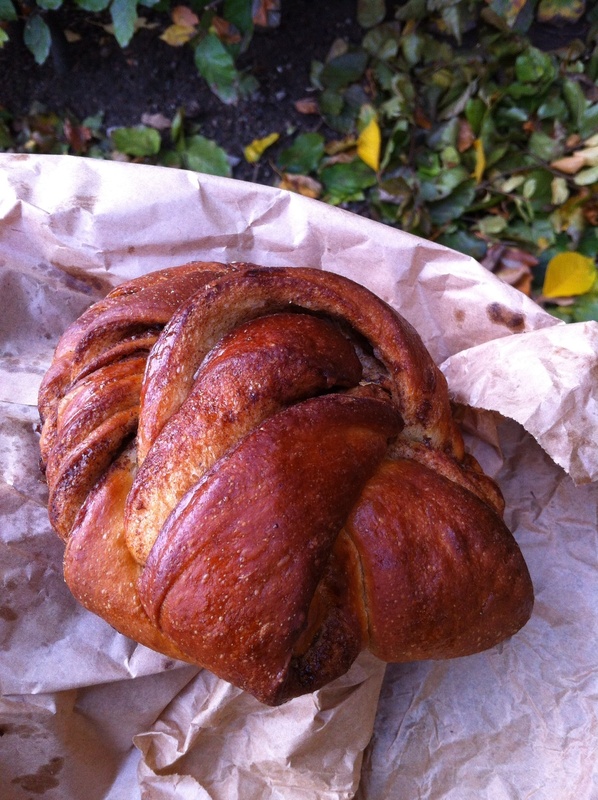 Mr Speranza said it is one of the nicest pastries he has ever tried, and that is saying something given how much he loves bakery goods and the fact that he is a superb baker. Dissolve the yeast in the milk, then add the other dry ingredients (i.e. all except the butter). Mix in a kitchen robot for 15 minutes at a medium speed. The dough needs to be smooth and shiny, but not sticky. Now, add the butter in little cubes, and mix for a further 5-10 minutes. Do not skimp on the kneading, it makes all the difference. Leave the dough to rest for 2 hours covered by a tea towel. Roll the dough out into a square (40cm x 50cm), and gently spread on the butter for the filling. You need to go all the way to the edges. Then sprinkle on the sugar and the cinnamon, and massage/press it gently, but firmly, into the butter. Fold the top one third of the dough towards the middle, and then the bottom one third on top (the dough is not a third of its original size). Roll the dough into a square, this time 30cm x 60 cm, and then cut it into 28 strips. Take two strips and squeeze them together at the top. Hold the end of the two strips between your index and middle finger, then twist the strips twice around the two fingers, put the end through the loop and pull gently. Place on a lined baking tray, and leave to rise until doubled in size (approx. 2 hours). Turn the oven on to 200C. Brush the kanelsnurrer with egg and/or milk and sprinkle with sugar. Bake for 12-15 minutes until baked through and nicely browned. They should be lovely and moist. Danish Storm is not a cake person. I am. So when she asked me to contribute a guest post on the subject of baking, I found it hard to choose a particular recipe. Then I realised that there is one cake in my baking repertoire that I cook more often than any other. A cake that is at the same time excellent tasting, not too indulgent (you could happily have a slice every day with your morning coffee), Italian in origin, and dead easy to make. It had to be it. So let me tell you about the ciambella. 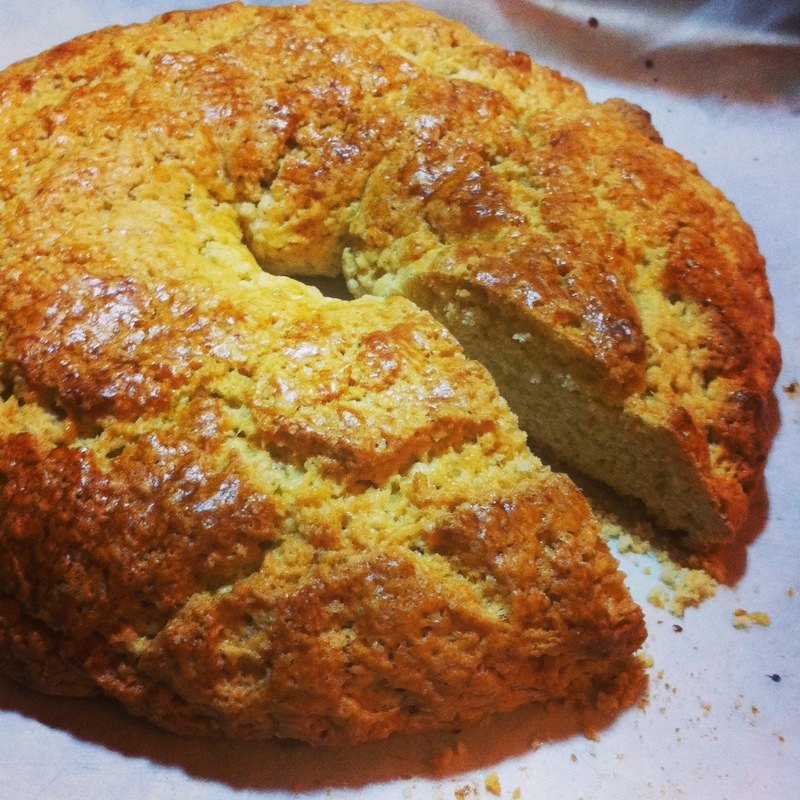 The ciambella is a round Italian cake (hence the name – ciambella means “tyre” in Italian) with an interesting floury texture, somehow in between a biscuit and a pound cake. It’s great for dipping in tea or coffee, and can also be served with desserts where its dry texture works wonders – particularly as an accompaniment to creamy puddings such as chocolate mousse or creme caramel. The basic recipe below is flavoured with lemon and vanilla, but can be easily changed to incorporate different flavours instead: rhum, amaretto liqueur, orange zest, orange blossom water, rose water, etc. 1) Rub the butter it into the flour and sugar with your hands until you get a mixture that looks like fine breadcrumbs. 2) Add the eggs, milk and salt and mix together into a dough. 3) Shape the dough into a thick sausage and form a ring with it. 4) Score the dough with 4 long slashes (in a criss-cross pattern). 5) Brush the ciambella with a glaze made with 1 tsp of beaten egg yolk and 1tsp of water. 6) Bake for 35 minutes at 190C (170C fan assisted).